Where to now for aviation? Last week’s first commercial flight of the Boeing 787 Dreamliner potentially marks the beginning of a new era for the aviation industry. 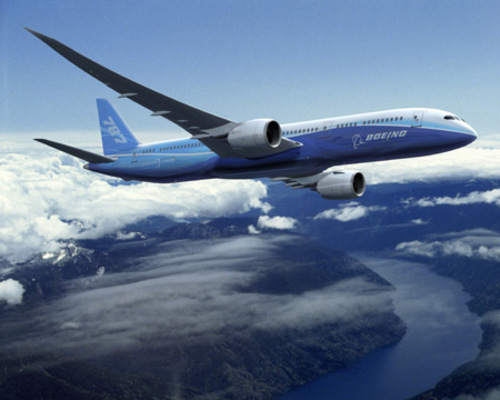 Its composite construction and 20% better fuel efficiency (than the 767) continues a long term trend of improvement by Boeing. But the numbers behind this essential global industry are daunting, albeit with impressive strides forward such as the 787. 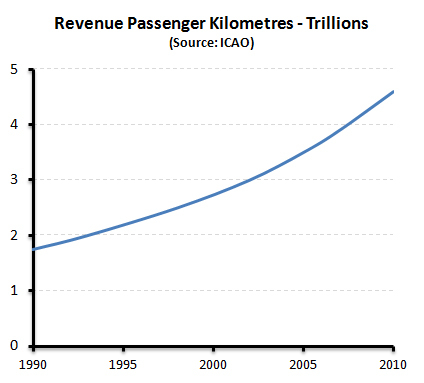 Revenue Passenger Kilometres (RPK) have more than doubled since 1990 and the Boeing Current Market Outlook for the period 2011 to 2030 has RPK growth rates surging ahead in many parts of the world at well over 5% p.a. such that by 2030 RPK in the Asia Pacific area alone is nearly 4 trillion. Globally, 2030 traffic is forecast to be about triple that of today. 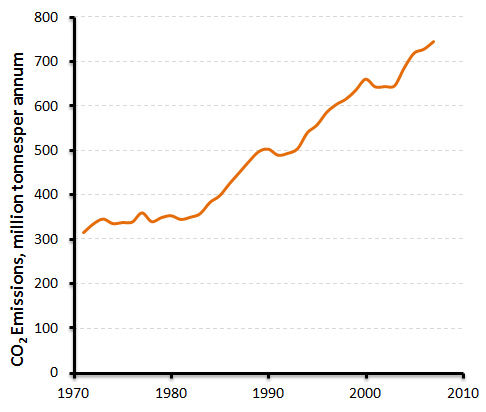 Total CO2 emissions (Source: IEA) have risen as well, but since 1990 the growth has been “only” 50%, compared with the more than doubling of activity. This points to the impressive jumps in fuel efficiency, with the Dreamliner delivering yet again. The chart above gives an indication of the improvements achieved by plane type. 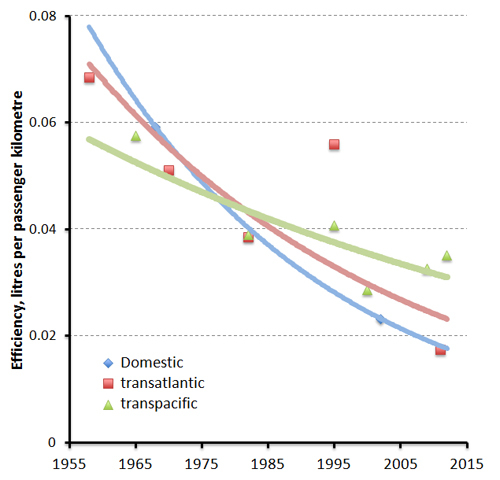 I wasn’t able to locate actual efficiency figures, so the chart has been derived from the fuel capacity, passenger carrying capacity and range of various aircraft plotted against the year of release for the aircraft in question. Clearly the trend has been strongly down, starting with the Boeing 707 in the 1950s. But how much further can this impressive trend extend? Airlines are also pressing hard to increase efficiency of their legacy fleets by taking steps such as reducing weight, incentivizing passengers to do the same with their baggage, optimizing schedules and pushing air traffic control and airports to improve landing, takeoff and taxiing procedures. 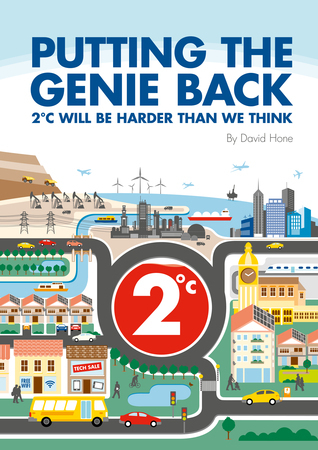 But if air traffic is to triple in just 20 years, efficiency will have to jump by even more than it has to date to deliver any sort of sustainable service. Increasing Kerosene (Jet A1) demand will not only put pressure on crude oil demand, but will also pressure the yield of kerosene from the barrel. This will require refiners to become more inventive in the processing of crude oil and could well point to even higher energy demand by refineries to make more transport fuel from the barrels of crude available. It may also point to an even faster turnover of the fleet as airlines scramble to upgrade to the next generation of fuel efficient aircraft – planes such as the 787 Dreamliner, A380 and upcoming A350 series from Airbus. Many airlines are now starting to experiment with biofuels and new production processes such as Fischer-Tropsch based Gas-to-Liquids with its high kerosene yields will add to the aviation fuel pool. But revolutionary step change airframes that might make up a future Boeing 800 or Airbus 400 series are unlikely to impact this 20 year picture, they just won’t be here in time or in sufficient numbers to make a difference (the Dreamliner was first mooted in the late 1990s). The2030 die is now largely cast with what we have and know about. The challenge of an absolute reduction in CO2 emissions from aviation is also an unlikely prospect given the above figures. Yet by 2030 global emissions need to have peaked and be showing real falls. Although aviation may well continue to show impressive efficiency improvements and could have introduced biofuels into the mix by 2030, sheer demand will probably mean a rise in emissions. This then puts more pressure on other sectors to reduce, such as power generation and road transport. Green growth or green confusion? 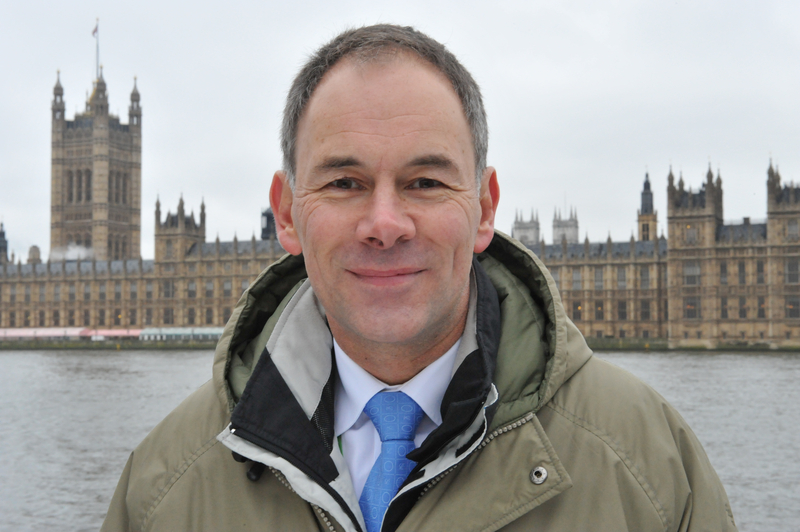 A carbon price for Australia – finally!